Testimonials mean a lot to today’s relationship-oriented consumer. With so much information at their fingertips, people are researching purchases of equipment and services far more than ever before, and when all the facts and figures have been entered into the equation, many consumers use likability as a tiebreaker. Surveys. As a contractor, your customer base likely spans a wide demographic profile. Some of those people may not be as accustomed to online technology as you are, but it’s important that you don’t count them out of the testimonial process. Create paper surveys, and mail them out to each customer shortly after you’ve completed a job. Include a link to an online version so your customers have options; the wider you cast your net, the more likely you are to obtain feedback. Email the online survey to anyone from whom you’ve captured an email address. Depending on the design of your website, you can either type those testimonials or capture the handwritten images to reflect authenticity. Ask Regularly. It’s important to be consistent and request feedback from all customers every time you finish an installation or provide service – even your pre-paid service agreement customers. Having a process in place and making it easy for your customers to respond is the key. Timing. The longer you wait to obtain feedback, the less likely you are to get it. 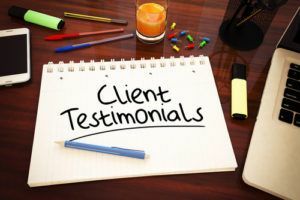 People respond when events are at the top of their mind, which means obtaining testimonials is a time-sensitive endeavor. Ensure that your inquiry comes quickly after the work is done so your customers have their experience fresh in their minds. At Continuity Programs, Inc, we understand the importance of testimonials, especially for contractors. What have you found to be the best way to capture testimonials and use them in your marketing? I work for a small business, and we are trying to increase our sales and get our name out there more. I really like these tips on getting more testimonials. I especially like your tip to ask regularly. I’ll make sure that that becomes a normal part of our sales interactions. Are there any regulations on what testimonials you can use? Thanks for the information and help!